Set on the edge of the pretty Coubre forest, Les Sables de Cordouan is a great place for nature lovers to use as a base while experiencing the camping holiday of a lifetime. The forest features numerous walking trails, while beaches that line the Atlantic Ocean are also waiting to be discovered. Families who like to be active while they are away are sure to have fun exploring the Charente Maritime region. In addition to a wealth of historical attractions, the Luna theme park is just a short drive away. This enchanting experience can be booked thanks to the team at LuxCamp. Why choose Les Sables de Cordouan? A beautiful sandy beach can be reached on foot in less than fifteen minutes from this luxury camping site and this is the perfect place for guests to unwind. The staff at Les Sables de Cordouan offer bicycle hire and cycling is the ideal way to explore the enchanting coastline. 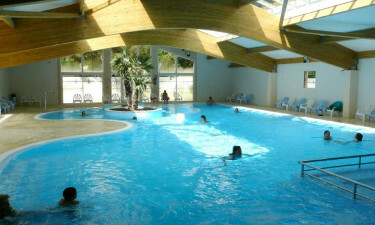 The large indoor swimming pool is open all year round and is the perfect place to splash around. Regular activities for all ages are also organised here.